Reserve 1/4 cup barbecue sauce for later use. Sprinkle steak with pepper; place in shallow dish. Brush with remaining barbecue sauce. Refrigerate 1 hour to marinate. Heat greased barbecue for indirect grilling: Light one side of barbecue, leaving other side unlit. Close lid; heat barbecue to 350ºF. Place steak on grate over lit area; cover. Grill 2 min. on each side. Transfer steak to grate over unlit area; grill 5 min. on each side or until medium doneness (160ºF), brushing with reserved sauce for the last few minutes. Remove from barbecue; cover to keep warm. Place onions in grill basket; set aside. Mix oil and honey until blended; brush onto tomatoes. Place grill basket and tomatoes, cut sides down, on barbecue grate; grill 2 min. Remove tomatoes from barbecue. Stir onions; continue to grill 3 min. or until tender, stirring occasionally. Slice steak. Serve with vegetables. 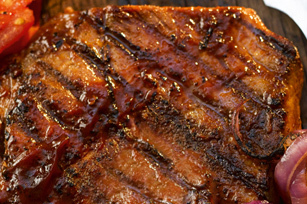 Prepare using Bull's-Eye Steakhouse Barbecue Sauce.